The newest ship of Regent Seven Seas Cruises, Seven Seas Explorer, is now possibly the world's most luxurious cruiseliner. 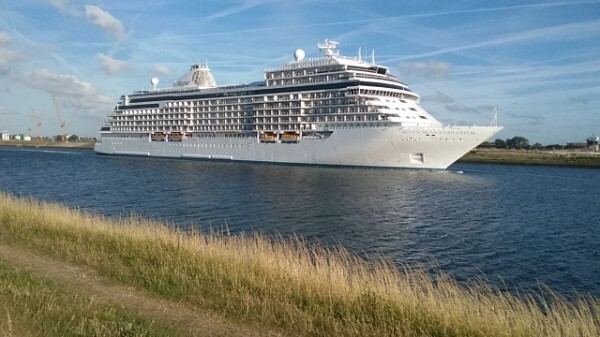 She visited Amsterdam for the first time at the 16th of june 2017 and is seen here just after leaving the IJmuiden locks. The first newbuilding since 2003, Seven Seas Explorer is the result of carefull planning by Regent Seven Seas Cruises to introduce a superlative luxury liner. The company gradually grew from its origins as a combine between two small cruiselines in 1990. With every introduction since their debut, the company increased its profile and kept to its origins, truly dedicated to their clients expectations. Starting as a very small combine with only two ships, they now operate a fleet of four, but all are in the worlds top ratings. At the 21st of january 2015, the keel for this ship was laid at the Fincantieri-owned Sestri-Ponente Yards in Genoa, Italy. The ship has a tonnage of 55.254, is 224 meters long, 31,10 meters wide and she has a draft of 7,10 meters. There are 13 decks for her lucky 750 passengers and 552 crewmembers. Driven by diesel-electric engines turning two fixed propellers, the ship is capable of a 23,5 knots maximum speed, although her servicespeed normally is 21,7 knots. She flies the flag of the Marshall Islands, homeported in Majuro. 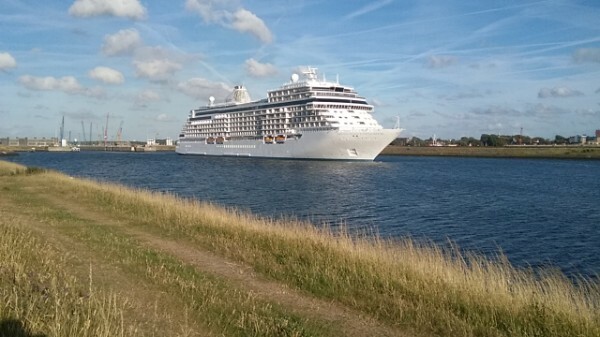 Launched at the 30th of october in 2015, this splendid new liner was delivered to Regent Seven Seas Cruises at the 30th of june in 2016. Rated as at least one of the most luxurious ships ever built, Regent really perfected their style aboard their newest gem. No expenses have been spared, with a good example for this available in the ginormous Penthouse Regent Suite at deck 14, where the bed alone costs a staggering $150.000! The bed took over a year to make and features a Savoir mattress made from the hair of a horse just bred for this purpose, costing $90.000 alone... Furthermore, the ships interiours are bathing in Italian Carrara marble, stone and gold leaf to really show what this ship is all about. Throughout, to add to the effect even more, 5000 Czech crystal chandeliers are adorning the ships lounges, restaurants, bars and atrium and at least 2200 pieces of art are shown, personally selected by the line's President Frank del Rio. Among those, a Picasso and a Chagall painting that are hung on the double doors entrance to the Regent suite. This 3875 square-feet suite has its own therapy room with ocean-view shower, a pair of heated marble lougers and a sauna and steamroom. Also, the lucky person renting this suite will have the possibility of a luxury car with driver in every port of call. The pooldeck is furnished with canopied bathingpods and privacy curtains. The art-nouveau inspired Chartreuse Restaurant has a window-facing wall of goldleaf patterning with microscopic crystal beads made in Chicago and shipped over to the wharf in Italy. At the Pan-Asian Pacific Rim Restaurant, diners pass a drum-shaped sculpture based on a Tibetan prayer wheel. To support the massive sculpture, the deck is re-inforced as it weighs more then a luxury car. Inside the 86-seat restaurant, the windows have lotus-flower inspired windowframes, a hand-painted mural, mirrored walls and olive-green seating. At the 16th of july 2016, Seven Seas Explorer was named by Princess Charlene of Monaco, of course also in Monaco. 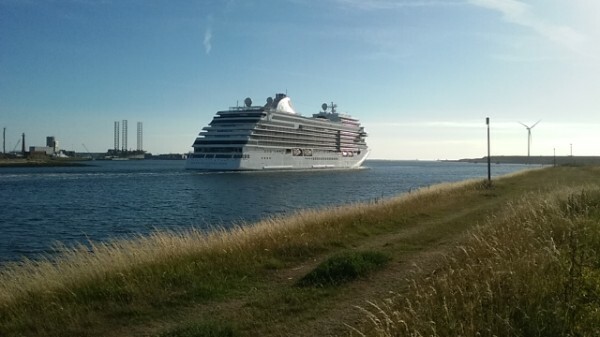 At the same evening, the ship departed for her Maiden Voyage, a 14-night Mediterranean cruise ending in Venice. Throughout the rest of the season, she kept sailing the Mediterranean, before repositioning to the Caribbean for the winterseason. In late spring of 2017, the ship again headed back to Europe, but this time taking on more northerly courses.